Find out how to use this new shape to measure and label individual rack units on network rack diagrams. 2016.05.23 – The full version and free trial are now available! If you’ve been following along the past few weeks, you can get a free trial or the full version of the product HERE. TODO: update some of the screen shots to support new features. I’ve just released a new product that I’ve been working on for several months. As you can guess from the title, it’s called the Über Rack Unit Dimension Line, and it takes the old Rack Unit Dimension Line to a whole new level! The primary motivation for creating this shape was to create an “über-class” Visio SmartShape for labelling and measuring rack-unit slots on rack equipment diagrams. You can choose a variety of tick-mark styles and text locations. You can configure prefixes, suffixes, starting values and steps for the tick text. But the shape can be used to measure and label any linear scale. You can make an inch or centimeter ruler. 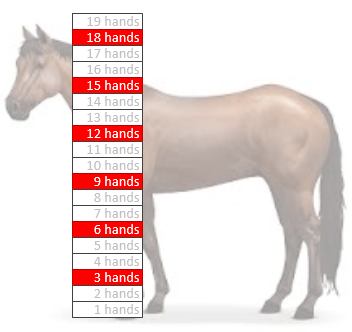 You can create a “horse hands” scale. The shape is fully configurable and quite versatile. 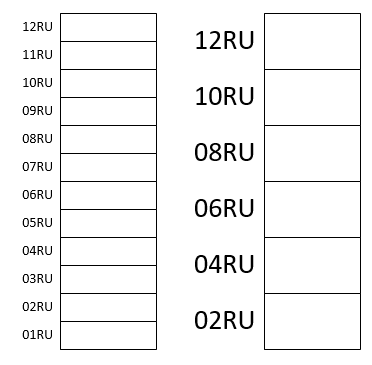 In the following article, I’ll talk about the history of these “RU” shapes, describe all of the features of the new shape, how to use the shape, and show-off some non-rack-unit uses as well. There will be a free version of the shape that has all of the features of the full version, but with a limited number of tick marks. The full version will include shapes with 50, 100, 200 and 400 tick marks so that you can best match shape-performance to your diagramming needs. Many years ago, I published the old Rack Unit Dimension Line. It could count discrete units of measure, such as Rack Units, which are 1.75″ (inches) in length. 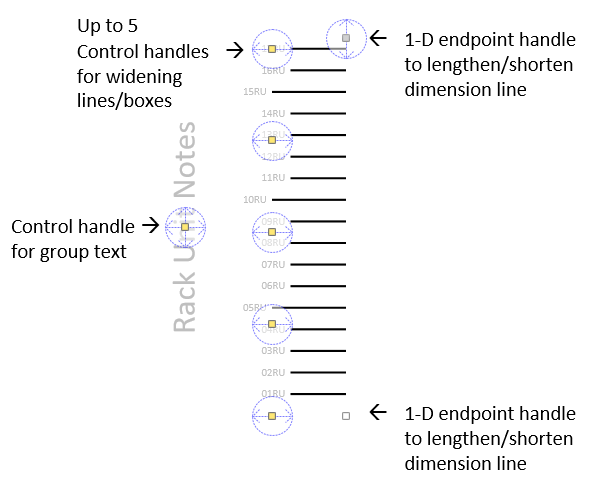 While Visio’s dimension line shapes do a nice job of reporting inches, centimeters, millimeters, points, etc; network folk think in “numbers-of-slots” and needed an alternative. So the old shape can be used for measuring chunks of linear space other than rack units. If this is all you need, go download that FREE SmartShape and read no further. Like I said, the new guy has tons of options! So yes, there has been a bit of work that has gone into expanding the capabilities. Hence the “Über” in the name! It’s the Help File for how to use it. So if you’ve purchased the product or downloaded the free trial version, then the rest of this article is essentially the user guide for the Über Rack Unit Dimension Line Visio SmartShape. When you click on RU dimension shape, or “select” one, you will see a variety of handles. In the illustration below the yellow handles are called Control Handles, and the white and gray ones are the 1-D Begin and 1-D End handles. If you’ve ever used a Visio connector or manipulated a straight line, then you’ve moved “1D handles”. The blue circles/arrows are visual aids that I’ve built into the shape. They serve to remind you what handles are for, until you are comfortable using the shape. You can turn them on by right-clicking the shape and choosing Show Visual Aids, near the top of the menu. Note that the Visual aids do not print, even when they are visible, so leaving them on won’t affect your output. 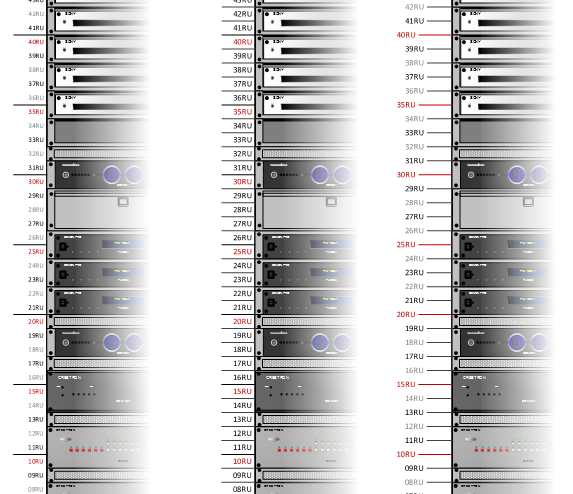 But once you’re a pro at using the Über Rack Unit Dimension Line, you will probably not want to see them any more. Generally, you position the shape by dragging it, then precisely place the start and end using the 1-D endpoint handles. There are up to 5 control handles for making the tick mark lines/boxes wider or narrower. Finally, if you type custom text onto the dimension line, another control handle will appear, so that you can freely move the custom text. Most of the fields in the Shape Data dialog are drop-down lists, but a few are text boxes that allow you to type in numbers or text. We’ll talk more about the Shape Data options in the Options & Settings Overview section below. Many of the settings that you find in Shape Data pane are also available via right-clicking. Two of them are not available in Shape Data, because they are more like actions than data settings. These two are: Flip and Reset Group Text Position. Flip allows you to “switch sides” so that dimension line is on the right-side of a network rack. Reset Group Text Position lets you restore custom group text back to its original position if you’ve moved it, and decide you liked the default position better. One note about Shape Data vs. the context menu: using context menu items will only affect one shape at a time. If you select multiple RU dimension line shapes, then you can use Shape Data fields to change them all at the same time. As you’ve noticed from the features list above, this shape has LOTS of settings, so that you can (hopefully) get your rack unit scale looking just the way you want. Whew! That IS a lot of options! The style of the tick-marks: boxes, lines, checkered boxes, indented lines, etc. Hopefully that makes it a bit more comprehensible. I’ve also added some dividers in the Shape Data pane to make it a bit easier to find the settings you’re looking for. Let’s visit the various settings in more detail, so you can see what affects what. The top section of the Shape Data settings relate to text formatting for each tick mark. This is the size of the unit that each tick mark represents. You can type a number-unit pair, such as 1.75″ or 1.75 in., or 5mm, 1 cm, 1m, etc. The number at which your ticks should start counting. Typically this will be 1 or 0, but if you are, say, measuring below-ground floor levels, you might start at a negative number. Each tick mark can represent more than one logical unit, but this setting really only affects the text display. If you change the step, you may want to counter-change the “Unit Physical Size” setting to adjust for the step. For example, you could configure the dimension shape to show two-rack-units per tick. 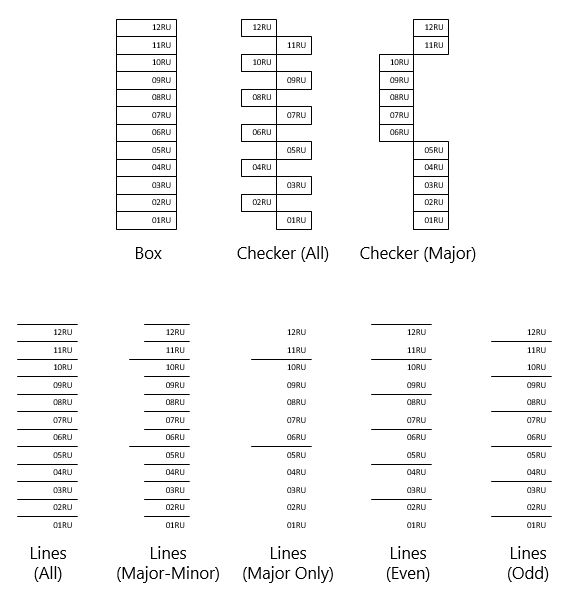 This can reduce clutter and busyness in your diagrams. So first, set Unit Physical Size to 2 x 1.75″ = 3.5″. Then set Step By to 2. Of course, we could adjust the text size in the second shape so that it isn’t so overwhelming. Or maybe choose to display the text inside the boxes, since there is more vertical space per tick. You can visually group ticks into repeating chunks by setting a “major division”. 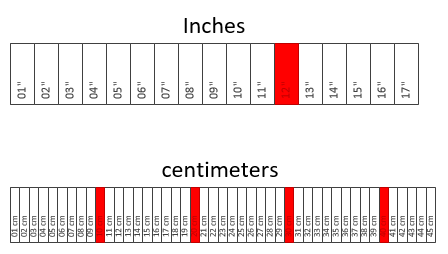 Imagine ten-centimeter major divisions along a meter-long ruler, or the longer quarter-inch lines on an Imperial-units ruler that shows sixteenths of an inch. 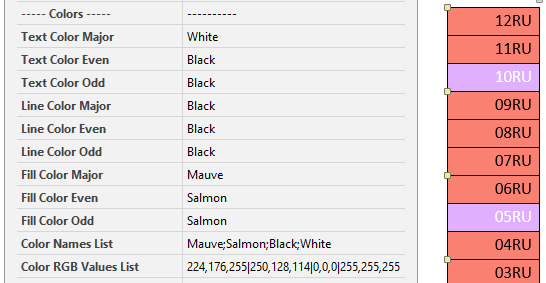 Once you’ve specified the number of ticks per major division, you can then specify colors for the tick text, lines and fill to further add visual distinction. 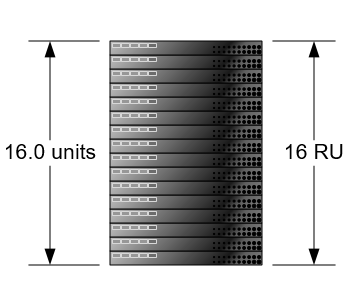 For a rack, useful major divisions might be 5 or 10 units in size. Allows you to pre-pend and append. Maybe you want to put dashes or asterisks before each value, or enclose the values in braces or brackets. The suffix is also where you put the units-of-measure for the tick marks. As shipped, this is set to RU, because I imagine the primary use for this shape will be for labeling network equipment racks. But the shape is fully configurable, so you could set the dimension line to measure “cubits”, or horse-height “hands”, or just about any linear quantity you can imagine. This is a read-only field that shows how the prefix, suffix and number format affect the look of the text. You can choose to show the text for All Ticks, Major Ticks, or at No Ticks. If you are heavily using the tick coloration, then no tick text might make sense, but it’s mostly there just for completeness. In the example below, we’ve created an inch ruler. The “Ticks per Major Division” are 12. We’ve used colors to show even ticks (gray), major ticks at each foot (dark red). We’ve picked a contrasting text color for the major divisions. Not all of the positions make sense for all tick styles. Above, we can see that “Middle (Outside)” and “Bottom (Outside)” don’t make sense for the major-minor line style. I didn’t spend the extra effort required to make these look right, because the “what it really means” was philosophically not clear. I think the other two settings “Top (Outside)” and “Middle (Inside)” settings work much better for the line-styles. 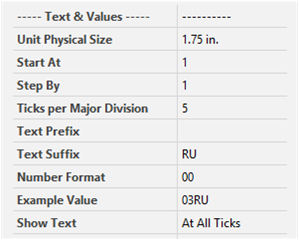 This sets the size of the text to be a percentage of the height of each tick unit. If you have a “major-minor line” tick style, then you can specify the minor tick length as a percentage of the major tick length. 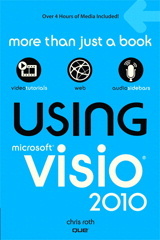 Note that Visio has a minimum font size of 1pt, so very small Unit Physical Sizes and/or small Font size Factors could result in less-than-adequate results. There are three groups of colors, which apply to the text, the line and the fill color of tick units. For each attribute, you can independently set colors for major ticks, even ticks and odd ticks. Having granular control over even and odd might be a bit of overkill, but you can create some nice effects. It also means lots of clicking on drop-down lists to get the shape set up just the way you want. Keep in mind that this shape wasn’t designed with the expectation that you would fiddle with these settings every time you use the shape. The idea is that you would configure a few variations that you really like, then use those over and over. The last two items allow you to customize the list of colors, in case the built-in set doesn’t meet your needs. As mentioned above, the colors for the shape are divided into three sets of three attributes. Depending on the tick style, some of the colors won’t be applicable. Below we can see an example that has text colors set to dark-red, dark-blue, and light-blue. The major line is set to red, and the even and odd lines are set to shades of gray. There will probably be a lot of cases where you only want the major ticks to have different coloration. 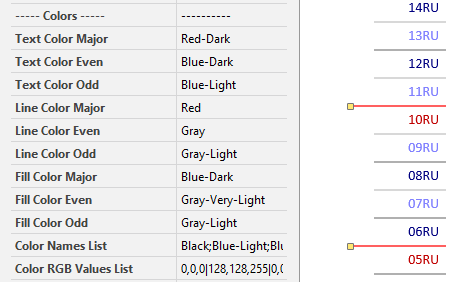 For these instances, you will want to set the “even” and “odd” colors to the same values. The built-in color set is a fairly simple of 21 colors. It includes light and dark variations on basic colors, along with white, black and grays. If you decide that these colors just aren’t cool and hip enough, you can extend the color set, or completely redefine it. 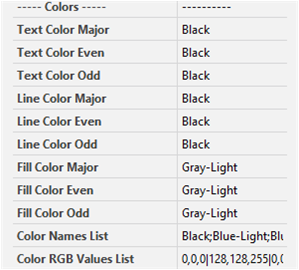 The color names are a semi-colon-separated list of names, while the RGB values is a list of “double-separated” color sets. The red, green, blue values are separated by commas, and the sets themselves are separated by the vertical bar, or pipe, character. Make sure the color names are in the same position as the RGB values. Note also, RGB values are from 0 to 255, where 255 if the “brightest” value, and 0 is essentially “no color”. As we can see from this hard-to-look-at example, with freedom comes responsibility! The shape has a built-in, overall dimension line, akin to the original Rack Unit Dimension Line. It shows the overall length of the RU dimension line shape, to the nearest integral unit. So if you stretch the shape to say, 12.5 units, the dimension line will snap to 12 units, and the text will reflect that. 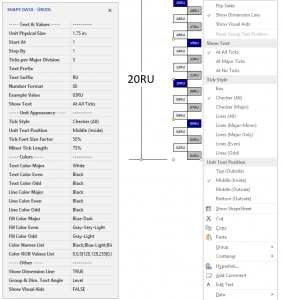 The font size of the dimension line can be set using Visio’s normal formatting buttons. Turns the light-blue circles and arrows on or off. The visual aids are useful for new users that want to get acquainted with the shape’s multitude of handles. Although they don’t print, they are unnecessary after you are familiar with using the shape. Since they are more like actions than actual data, it didn’t make sense to put them in the Shape Data pane. 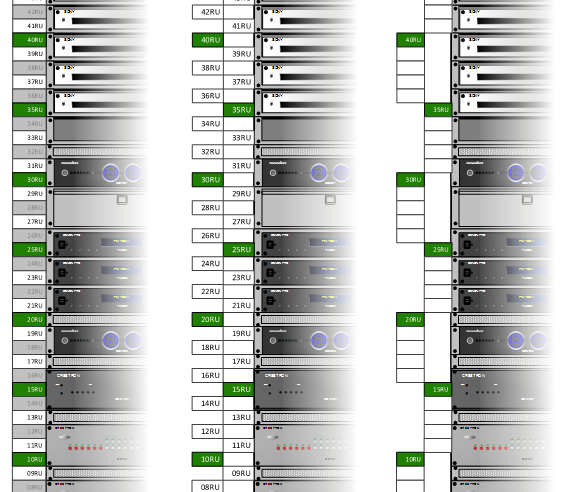 Flip allows you to “switch sides” so that dimension line bits are on the right side of a network rack. If the shape is already flipped, then Flip simply flips the tick marks back to the left side of the shape. Reset Group Text Position lets you restore custom group text back to its original position if you’ve moved it, and decide you liked the default position better. If the text is at the default position, then this menu item is disabled. 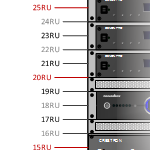 Since the shape is so configurable, you don’t have to use it just for labeling network racks. I’ve coddled a few examples together here to get your creative juices flowing. An obvious example is to build Imperial and Metric rulers. Unit Physical Size = 1 in. Unit Physical Size = 1 cm. Horses are measured in units called “Hands”, which are 4-inch increments. Unit Physical Size = 4 in. [TODO: other examples. High-water mark, Construction site “Bents” grids, Brick and floor tile grids, what else? The free trial supports up to 10 tick marks, along with all of the options that the full version has. So you can test it out on your machine, make sure it works, and verify you like it works, and that it is something you need! The full version contains four master shapes in a stencil that you can place in your My Shapes folder (ie: “Favorites”). The four shapes support up to 50, 100, 200 and 400 tick marks. For performance and file size reasons, you’ll want to use the smallest version possible. 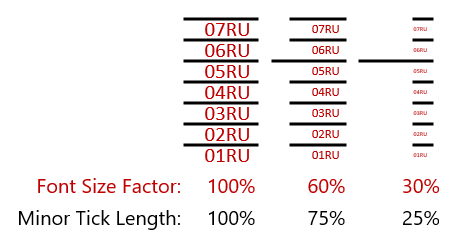 I think for most network racks, the 50 RU version will work just fine. But this shape can be used for a lot of other purposes, where the 400-tick-mark version might be really useful. Let me know what you come up with! Good question. Shall we discuss it openly here in the comments? (I’ll probably delete them after “we’ve” decided. The quandary I have is individual vs. corporate users. If someone is using this for their job, then it’s probably still useful and valuable, even for, say USD 40.00. But for an individual that is used to buying sophisticated phone and tablet apps for $2.00, then they might find $40 ludicrous. What do you folks think? I appreciate any feedback!